Many people will have a disability at some stage in their lives. For some, the disability will be temporary. Others may be affected for a lifetime. Whatever the type or impact of a disability, everyone has the right to be an active member of their community and to have a say in the decisions that affect their lives. The United Nations Convention on the Rights of Persons with Disabilities, which Australia ratified in 2008, sets out the role of governments to make this a reality. However, negative attitudes, physical barriers and difficulties accessing necessary supports still limit the opportunities of people with disabilities to find work, study, socialise and be included in community life. In Australia, the Disability Discrimination Act protects people across Australia from unfair treatment in many areas of public life. It also promotes equal rights, equal opportunity and equal access for people with disabilities. Around 6.8 million Australians (40 per cent) aged 18 years and over report having a disability or long-term health condition. Most people with disabilities (87 per cent) are restricted in carrying out at least one everyday activity, such as self-care, mobility or communication. The likelihood of having a disability increases as people age. For example, 7 per cent of children aged under 15 years, 15 per cent of people aged 15 to 64 years and over half (53 per cent) of people aged 65 years and over report having some form of disability. In 2009, 290,000 children aged 0 to 14 years reported having a disability. Over half (57 per cent) had a profound or severe disability and almost one in five (18 per cent) had a moderate or mild disability. People with disabilities are more likely to experience poverty, live in poor quality or insecure housing and have low levels of education. They are often socially isolated, with fewer opportunities to take part in community life. Mental health problems and mental illness are among the greatest causes of disability, diminished quality of life and reduced productivity. Australia ranks lowest among OECD countries for the relative income of people with disabilities. Overall employment rates for people with disabilities remain low, with workforce participation at around 54 per cent compared to 83 per cent for people without disabilities. In NSW, young people with mental health disorders and/or cognitive impairment are at least six times more likely to be in prison compared with young people without disabilities. Despite progress towards making all public transport in Australia fully accessible by 2022, 1.2 million people with disabilities report difficulties using public transport. Research has shown that more than a quarter of people who report sexual assault have a disability. 90 per cent of women with intellectual disabilities have been sexually abused. In 2009, children with disabilities had significantly higher rates of participation in school compared to children without disabilities (82 per cent and 77 per cent respectively). This reflects a growing number of children with disabilities staying in school for longer. Most people with disabilities (94 per cent) have the support they need to live in private residences; 74 per cent live with others and 20 per cent live alone. People with disabilities are also more likely to own their own home outright (24 per cent) compared with people who do not have disabilities (16 per cent). In July 2013, the National Disability Insurance Scheme was rolled out in Tasmania, South Australia, Victoria (Barwon area) and NSW (Hunter area). From July 2014, it will commence across the ACT and in the Northern Territory (Barkly region) and Western Australia (Perth Hills area). The full national scheme will commence progressively from July 2016. The life expectancy of Australians born with Down Syndrome has more than tripled in the four decades to 2002, increasing from 18 years to 60 years. A contributing factor to this positive outcome is the shift in public attitudes towards Down Syndrome. The Commission helps people resolve complaints of unfair treatment under the Disability Discrimination Act. We also assess applications for temporary exemptions under the Act and provide advice on laws, policies and programs that affect people with disabilities. The Disability Discrimination Commissioner works in partnership with others to help all Australians understand their rights and meet their legal responsibilities by conducting public inquiries and negotiating disability standards and guidelines. Australian Bureau of Statistics, 4159.0-General Social Survey: Summary Results, Australia, 2010 (September 2011). Australian Bureau of Statistics, 4429.0-Profiles of Disability (Rates of Disability), Australia, 2009 (June 2012). Victorian Health Promotion Foundation (VicHealth), Disability and health inequalities in Australia (2012), p 2. 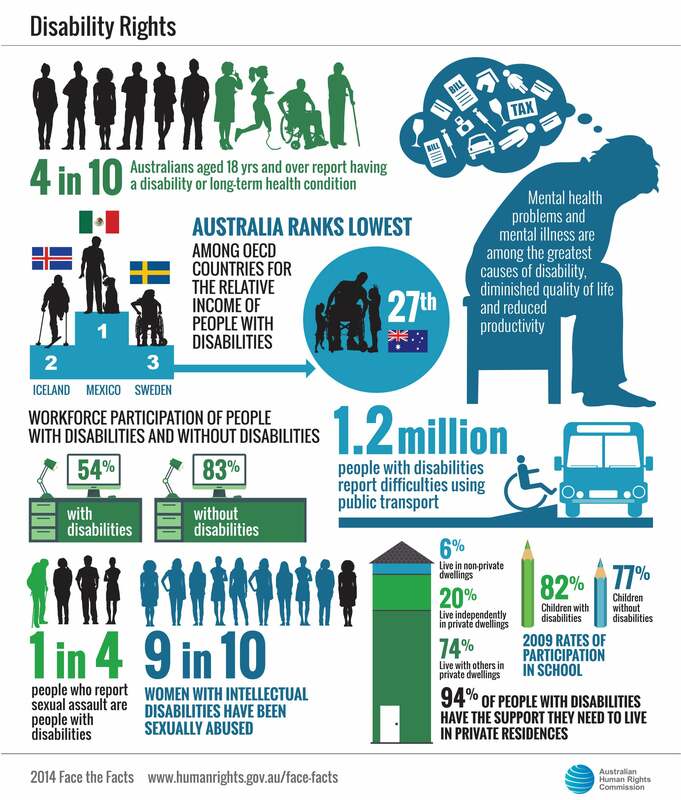 This prevalence data is based on a VicHealth analysis of the Survey of Disability, Ageing and Carers 2009 and the current ABS disability classification system. World Health Organization and World Bank Group, World report on disability (2011), p 263. Australian Bureau of Statistics, 4446.0 Disability (Main disabling condition), Australia, 2009 (May 2011). Organisation for Economic Co-operation and Development, Sickness, disability and work: Keeping on track in the economic downturn – Background paper (2009), p 34. Australian Bureau of Statistics, 4446.0 Disability (Labour Force), Australia, 2009 (May 2011). University of New South Wales and PwC, People with mental health disorders and cognitive impairment in the criminal justice system: Cost-benefit analysis of early support and diversion (2013) p 4. 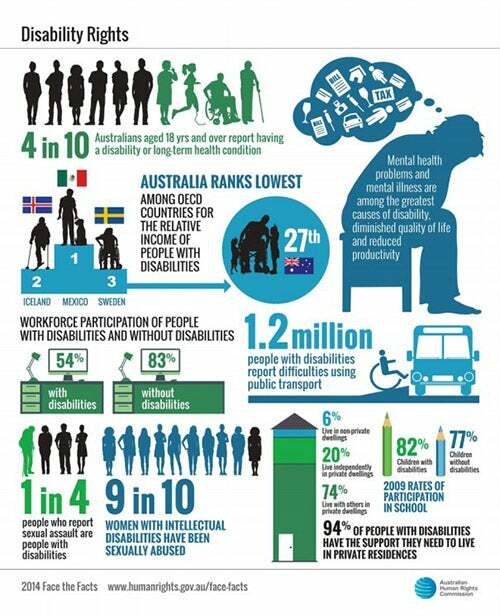 Australian Bureau of Statistics, 4446.0 Disability (Transport), Australia, 2009 (May 2011). Statewide Steering Committee to Reduce Sexual Assault, Office of Women’s Policy, Department for Victorian Communities, Study of Reported Rapes in Victoria 2000–2003: Summary Research Report (2006), p 16. VicHealth, Disability and health inequalities in Australia (2012), p 8. Australian Bureau of Statistics, 4429.0-Profiles of Disability (Children at school with disability), Australia, 2009 (June 2012). A Bittles and E Glasson 2004, ‘Clinical, social, and ethical implications of changing life expectancy in Down syndrome’, Developmental Medicine & Child Neurology, vol 46, no 4 (2004) p 282.